Dubai: Is that a hole in the sky? And why is there a gap? If you think there might be something amiss with the world and the folktale of Chicken Little comes to mind, along with the infamous phrase “The sky is falling!”; don’t worry. It couldn’t be further from the truth. During Sunday’s heavy bout of rain that affected various parts of the country, residents in Al Ain witnessed a phenomenon that has been rarely caught on camera in the UAE. Sharjah-based astronomer and meteorologist Ebrahim Al Jarwan posted the short video clip on his personal Twitter account, and explained that the so-called-hole in the sky is called a fallstreak hole. Al Jarwan tweeted about this rare and beautiful phenomenon, which was seen on Sunday morning in Al Ain city. Also known as a hole punch cloud, the fallstreak hole is a large gap, usually circular or elliptical, that can appear in cirrocumulus or altocumulus clouds. 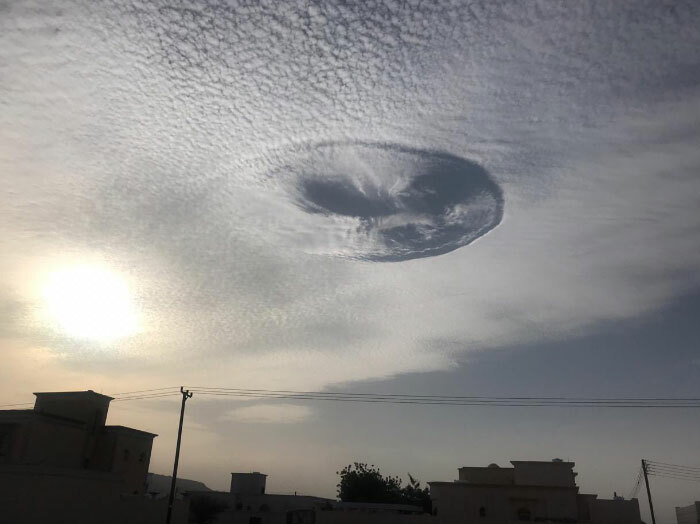 The fallstreak hole was also spotted above Buraimi and Maḩḑah, northwest Oman. When a hole punch cloud appears, it can form to look like UFOs, sky holes and cloud circles. According to the NWS website, a fallstreak hole forms when, “high to mid level clouds, such as altocumulus, are often composed of tiny water droplets that are much colder than freezing, but have yet to freeze. The NWS further added that a hole is then left behind, which will start to expand outward as neighboring droplets start to freeze.